Comments - Unusual kabuki design featuring a group of actors meeting on a street lined with teahouses with a theater in the background. Each figure is identified with a name cartouche and the name of a shop. 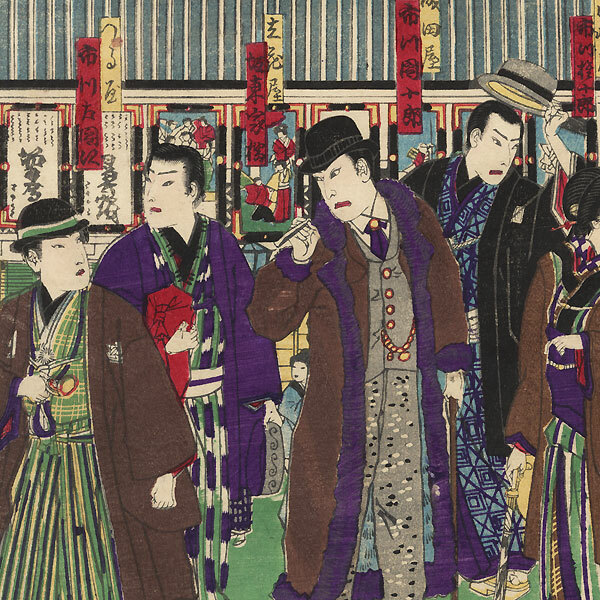 The women and many of the men wear traditional kimono, while a few of the fellows sport the latest European fashions, including a fellow in the center wearing polka-dotted pants, a vest with a watch chain, a shirt and tie, a brown overcoat with furry purple trim, and a bowler hat. The left panel includes Iwai Komurasaki of the Yamatoya, Onoe Kikugoro of the Otowaya, Arashi Rikan of the Hamuraya, Ichikawa Kuzo of the Mikawaya, and Ichikawa Sadanji of the Takashimaya. The center panel features Onoe Taganojo of the Otowaya, Ichikawa Gonjuro of the Kawasakiya, Ichikawa Danjuro of the Naritaya, Bando Kakitsu of the Tachibanaya, Ichikawa Udanji of the Tsuruya, and Onoe Kikunosuke as Otowaya. 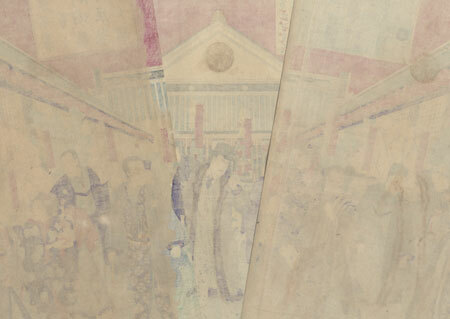 The right panel includes Suketakaya Takasuke, Nakamura Fukusuke of the Seikomaya, Kataoka Gado of the Matsushimaya, Nakamura Shikan of the Sekomaya, and Onoe Matsusuke of the Otowaya. An intriguing design, wonderfully detailed. Condition - This print with excellent color and detail as shown. Three separate panels, backed with paper. Large tear at edge, repaired. Slight toning and soiling, a few spots. Please see photos for details.